Since it’s a bio-pic, Shirdi Sai should not be viewed like a commercial film. Every one of us have the curiosity to know more about Sai Baba. We might have read some books. But none of these readings give us a complete picture on life and times of Sai Baba. The film Sai Baba attempts to tell the world about the making of an enlightened man called Sai Baba who is revered as a God today. 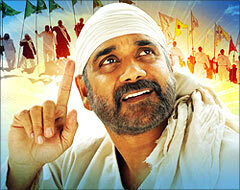 Nagarjuna is the major highlight of the film and he convinces us all as Sai Baba. You may watch Shirdi Sai with an academic interest. Cinematic glitches aside, what works in the movie is that it focuses more on the spirit of the teachings rather than the miracles that Sai Baba performed, which was the crux of the previous films like Shri Sai Baba Mahatyam, widely regarded as the definitive film on Sai Baba. As far as viewing experience goes, this film falls short of the standards set by that K Vasu film but it has a few moments nevertheless. The writing proves to be a stumbling block as the lines just don’t have that effect. Forced comedy tracks involving Sayaji Shinde look mediocre at best. It’s isn’t a film that will douse you with that feeling of divinity, but makes for a one time watch. How much you like this film might just be a matter of how staunch a devotee of Sai Baba you are. A film of this kind is bound to eulogise the central character, particularly since he is endowed with divine powers. The director Raghavendra Rao has tried to maintain a balance between entertaining viewing and capturing some of the spiritual essence as well.Shirdi Sai is not just a devotional to be seen by an older audience. Anyone can see it for the relevance of the simple teachings of the saint from Shirdi.The film has a shot of the sanctum at Shirdi as a bonus for followers of the sage! But despite all the positives, the film didn’t really have that spark or the vibration that really sets the crowds going. Given the fact that it is more of a remake, comparisons are bound to rise with the older version starring Vijayachander. And it must be said that this is no match to that. As such, the film runs smoothly without any hiccups but the problem is there are no deep moments of reflection or a situation which connects you strongly to the subject. The intensity factor which can generate a communion in the theatre is absent.Director screwed up the devotional factor by placing an irritating comedy track with Sayaji, Ali, Ananth and Dharmavarapu. The film is made with a chain of miracles but will not hold any story line. If proper home work and research was done, then the film would have touched a higher mark. Unlike Annamayya and Sri Ramadasu, Nagarjuna’s Shirdi Sai is interestingly narrated basic Sai’s philosophies. Without deviating much from the known life of Sai Baba, the makers recreate moments to show exactly what happened in his life and how he attained enlightenment.The film doesn’t have a storyline per se but the series of anecdotes weaved out of meaningful ideologies are definitely something to look forward to. At the end of the film you need to ask yourself one question – Will you go home and worship different gods by different names or will you stand by the line Sabka Malik Ek Hai? Director Raghavendra Rao has maintained perfect balance between the spiritual concept and dramatic happenings of miracles, perfect colors have been used for songs. First half of the movie has been directed well however there is a slight drop in second half also lacking to catch the attention of audience until the last 20 minutes of movie.A huge round of applause for Nagarjuna for taking up this role which needs a serene look after having worked on various other aspects, it is good for all those who are completely into spirituality of Sai Baba without any expectations.